Welcoming ? The smell of fresh toast travels up to you in the morning. Charming ? Imagination has triumphed in this 17th century house in a medieval village deep in burgundy's countryside, where the proprietor Rita Florin speaks fluent English. You will be enthusiastically welcomed here and properly cared for : attention to detail is essential and the owner treats guests like visiting friends. For those who wish break the journey on the way from Paris to the south of France, Burgundy and « Le Tabellion » in Noyers-sur-serein is an ideal place to stop off and have a good night's sleep. We are five or six hours from the English Channel, two hours from Paris, three hours from Lyon, with a very convenient access to highway A6. You will feel fortunate to stay in « le Tabellion » a wonderful B&B with character run by Rita Florin. Rita's inn, and her home, will make you feel transported to another world. You are in a real family house at some fairytale time in the middle ages, in a hamlet that is truly historic, medieval, and listed among the 100 most beautiful villages in France. 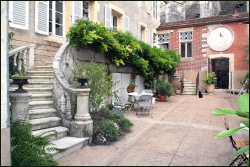 From the courtyard of « le Tabellion » you look over a wall to a gothic church, complete with gargoyles. The town is complete with medieval ramparts, the ruins of a chateau, and lovely walks up narrow, historic streets. The historic main house, with handsome stone staircase off the entrance courtyard, offers 2 upstairs bedrooms with smart décor and a shared bathroom (bathtub). « Le flat » is a large suite consisting of a sizeable sitting-room with a fire place and a good-kitchen, adjacent to an even larger bedroom with an elegant marble bathroom, and opened to the courtyard. 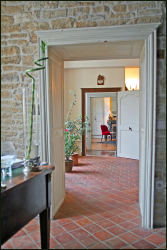 « Les Hirondelles », has a big bedroom (twin beds ) with private bathroom and facilities, opened to the courtyard, too. Guests have full access to the main house, the ample courtyard, the lobby /salon, gardens. Free internet and wifi access. Fluent English spoken. Breakfast is served onto the main house or in the garden during the summer season. 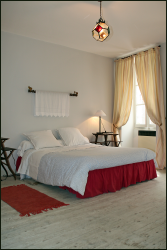 Additional person per night: 25 euros. Free secured parking for bikes or motorbikes. Payment in cash or bank transfer. No credit card.